The Blue Mountains are a beautiful mountain range, located around 20 km from Reykjavik, by the lava plateau of Hellisheidi. The mountains are the most popular skiing venue for the people of Reykjavik and its surroundings. The area is strong with volcanic activity, with frequent earthquakes and the lava that became Kristnitokuhraun lava field flowed from there in the year 1000. Kristnitokuhraun is located at the outskirts of the Blue Mountains. 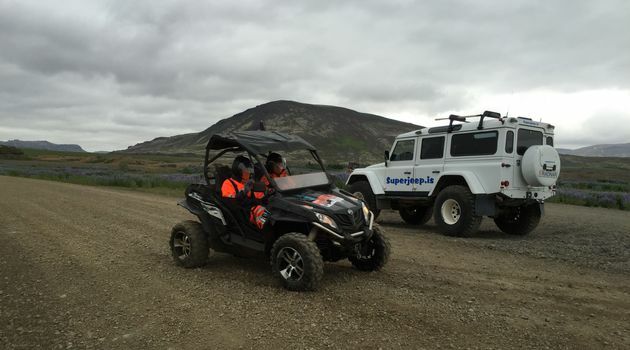 Strap into a two-seat Buggy with your partner and prepare to overcome obstacles in the rugged landscape by the slopes of Esja Mountain; climbing hills, running through river beds and much more. This Buggy tour is for those who crave bumpy, dusty, dirty driving thrills, while getting up close and personal with nature. No extra charge for dust, mud, water splashes, or even snow! Our Buggies are equipped with 4-point harnesses for your safety and automatic transmission for driving ease. All you need is a spirit for adventure, and a valid driving license for the driver. Highlights of the Superjeep Blue Mountains and Buggy Adventures Blue Mountains Lake Kleifarvatn Lava fields Stóra Eldborg volcano Black sandy beaches Lake Þingvallavatn Buggy From Rate you can choose whether you travel in in our famous Superjeep (up to 6 persons) or Monster truck (up to 10 persons).